June 22, 2012 — Ethiopian dictator Meles Zenawi appeared visibly thin and frail during the G-20 summit held in the Mexican resort town of Los Cabos last Tuesday, raising speculation that the 57-year-old former guerrilla fighter's health is rapidly deteriorating. Rumors of the premier's ill-health were first brought to light by ESAT last week, after unnamed sources tipped off the Amsterdam-based satellite news agency over Zenawi's secretive and frequent medical trips to Brussels, who is reportedly suffering from a persistent grade III brain tumor. Speaking on condition of anonymity, a security officer with ties to the elusive Ethiopian National Intelligence and Security Service, revealed to Durame by phone that Meles is "gravely ill" and does indeed suffer from a number of aliments, including Astrocytoma, type 2 diabetes, and depression. 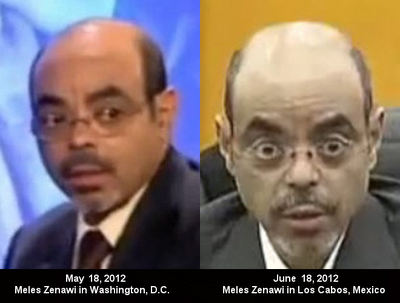 "Meles Zenawi's gaunt appearance of late does seem to indicate he's suffering from some type of severe aliment. It seems decades of poor diet, excessive drinking and smoking have finally caught up with him. ", said Zeray Gebremariam, a 58-year-old former TPLF fighter by phone. Despite the preimers attempts to conceal his alcohol and cigarette addictions from public eye, he has on rare occasions given inklings to journalists of his battles with substance abuse. In 1991, upon observing a no smoking sign during a breif exam in London, Meles said to a reporter, "I've spent the last 17 years fighting a civil war but I've never been so frightened as I am now. There's no way I'll sit the exam without a fag! [British slang for cigarette]"